Best Surround Speakers Use Multiple Drivers. . .
Axiom's best surround speakers for medium to large rooms, the QS8s, in Maple with a Nutmeg stain. Wherever you are, just stop and listen for a moment. Be alert to all the sounds youre hearing. If you're outside in a city, or in the country, there’ll likely be a multitude of sounds impinging on your ears from every direction. Even if you’re in an office, you’ll notice the familiar ambient sounds—the background whir of the air-circulation system, the tapping of keys on computer keyboards, distant muffled city sounds (unless the windows are open), and so on. We’re all surrounded by sounds much of the time, and that’s the idea behind the purpose of surround sound speakers in a 5.1-channel home theater or multi-channel music system: to create a sense of immersion in a sound field, with some degree of focus on directional aspects of particular sounds. 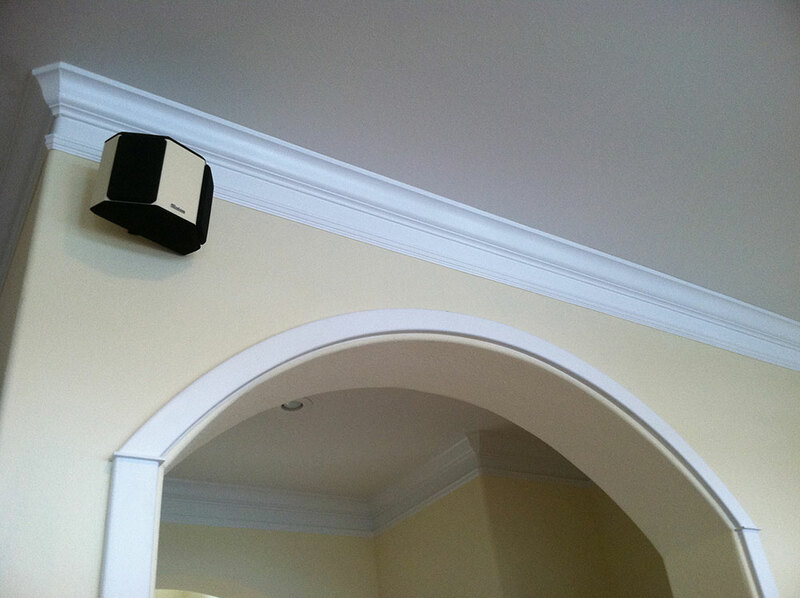 It might seem logical in a home listening environment to position direct-firing speakers in the surround speaker locations at the sides and rear of the room. However, the nearby surfaces in typical rooms—the walls, floor, and ceiling—are relatively close to us, so with direct speakers, the sounds dont have much opportunity to reflect from different surfaces, which isn’t how ambient sounds reach our ears in real life listening. The design which makes the best surround speakers is one in which a group of drivers facing different directions disperse the sounds towards all the surfaces in the room. The resulting reflections reach our ears from many directions, which is a pretty good simulation of how we hear ambient and multiple sounds in real life. Axiom’s QS8 and QS4 surround speakers use top and bottom-mounted woofer/midrange drivers and two angled tweeters to scatter surround channel information in every direction in your home theater or listening room. And what’s amazing is that the best surround speakers “disappear” as sources of sound, leaving you immersed in a strikingly realistic sound field. Sometimes, soundtrack and recording engineers will intentionally “hard-mix” a direct sound to a particular location—say, a crow cawing in a tree to the left side/rear. The Axiom QS-8s will still recreate that hard-mixed directional cue within the ambient outdoor sound field with no loss of directional accuracy. Try surround speakers with multiple drivers: it’s a big step up in home theater and music reproduction. Get handy set up tips for getting the best surround speakers sound.